Using 3D printing in industrial design is becoming more popular. With the help of 3D printers, it is possible to produce various design ideas in short period of time, and to find the visually best and most appealing solutions, but also to technically test the design, to see how it functions in practice. Using 3D printing methods, it is possible to adjust and improve the design along the way. 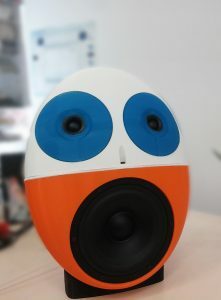 One of the advantages of using 3D printing is the ability to create not only prototypes of the products, but also manufacture the products in small volumes, as Audiolens has done with their speakers. 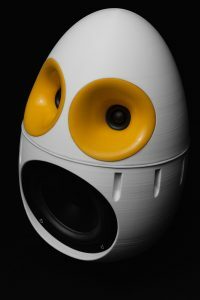 This come in very handy to clients that request the design of the speakers to be modified to suit their needs. 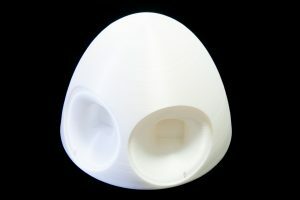 Janis Irbe, modeling for unique offices and café’s speakers, which allows to listen to music in the highest possible quality, decided to use 3D printing methods, seeing as it could be a solution to many problems which comes with the traditional manufacturing methods. While creating the speakers, the customer chose the design, the materials, shapes, speaker placement, as well as chosen and adjusted the frequencies, in collaboration with Mass Portals experts using Pharaoh printers. Creating blueprints, printing and testing and adjusting the models over a period of 6 months has led to the speaker being the perfect solution between high quality sound and design, which perfectly fits in and even adds to modern interior. Speakers are created in a way so the sound quality, and the design could be in the highest possible quality and so it would be able to please even the most demanding customer’s needs. Audiolens speakers are created light and durable using 3D printing as opposed to the heavy wooden speakers, allowing for solutions that are more modern and also increases the quality of the sound. Audiolens secret of high audio quality is found in the pleasing oval shape and inner filling of the design, which is possible due to 3D printing. Inner filling is made from Covestro TPU material as a unique sieve, that suspends the sound, and removes the excess resonance also known as parasitic vibrations, because it is flexible, but very strong, holding the main part of the speaker together without being too dense. Thanks to the elastic material the parasitic enclosure resonances are reduced at least 3 times, and the oval shape of the speaker positively reduces sound diffraction effects making speakers audibly “disappear”. says speaker designer Janis Irbe. The thinner speaker housing, the higher is the quality of sound produced – 3D printing allows us to achieve both of these things, without reducing the durability of the speaker. Speaker housing created using Mass Portal Pharaoh XD40 (just as the internal sieve) from Covestro TPU 60D material are only 3mm thick, whereas using classic materials they would require thickness in usual 12 – 30 mm range causing a significant weight and drop in the sound quality due cavity resonances. The speaker’s frames are printed using Covestro TPU D70, on Mass Portal Pharaoh XD20 printer, whereas the seal and ‘’legs’’ are printed using Covestro TPU A73 on Pharaoh XD40 printer. In general, printing one scan takes 5 – 6 days. 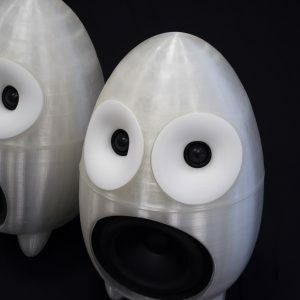 Audiolens speakers are created combining the most successful design, internal structure and best material, which are supported in 3D printing, reducing the costs which would been much bigger using other methods such as the milling method. Audiolens has created 3 different variations of speaker prototypes, perfecting the sound quality and design. These models are an excellent example of how it is possible to manufacture functional and usable parts in small quantities. The creator, Janis Irbe highlights that the biggest advantage to 3D printing compared to mass production is the ability to be able to quickly adjust the product, manufacture flexibly and adjust the design of the product which is very actual in the design world. The ideal version of production in the future would be the ability to combine the methods of traditional mass manufacturing with the endless possibilities that are provided by 3D printing. Audiolens speakers are an excellent example how 3D printing allows to manufacture high quality products without limiting the creative minds.